Electric unicycle is not strange to the public now. People are likely to treat it as a transporter other than a toy. There is someone saying in this circle: “electric unicycle is expected to be like the cellphone, everyone will have one in the future”. Indeed, electric unicycle bring great convenience to the public. The age group using electric unicycle is between 20-40 ages, for it meets the requirement of this group whatever its design and usage. The cool outfit of electric unicycle meets the trendy needs of this group. Although electric unicycle is best selling now and have large market, it will not be an easy product for retail staff to sell. The reason lies in it is not easy to learn not like cellphone and camera, which a lot of potential consumers will doubt they can learn it and hesitate, then give up buying. It will be a bad news for manufacturer. Airwheel is doing great and solves this problem easily. It has launched Q5, which is different from the product of other brand. 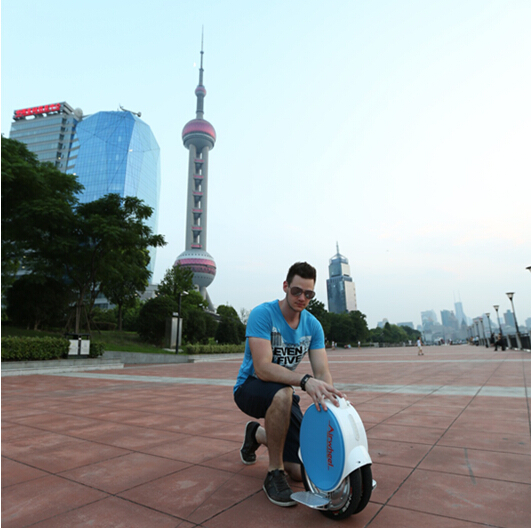 Q5 adopts twin-wheel design, which is more stable and easy to handle. My friend opens an exclusive shop for electric scooter and I almost tried every unicycle in his store. When Q5 is available in his store, I am attracted by its appearance. Compared with other electric unicycle in the market, Q5’s color is appealing and looks cool. Although I can ride electric unicycle, I will need some time to adjust it. However, for Q5, I don’t need much time to adjust, for it is twin-wheel designed and can stand alone. Even if people who never tried one can stand easily on it. Q5 gives new learner psychological comfort and let them to learn boldly. I believe if one product wants to attract more customers, it should attach great importance to its design, providing a safe reliable and easy-to-grasp product. Airwheel technology did it, which is the benefit for manufacturer.